Today I start a 3-day journey to see my grandmother. I’ll be driving six hours to IL where I’ll get in the car with my mom and dad and then we’ll make the 16-hour trek down to Florida. My bags are packed, my selection of books are tucked into the car and as soon as I post this, I’m giving Murphy one more cuddle and then I’m hitting the road. Road trips can be bad for your health — sitting in one position for multiple hours, poor selection of food along the highway, sleeping with your head against a window and when you wake up you have a twinge in your neck for a week. So it’s important to plan ahead. We have a tradition in our family of eating egg salad sandwiches on car trips. My mom started it when we were kids and drove to Florida for a couple of weeks in the summer. She didn’t want to leave the eggs in the fridge so she’d hard boil them and we’d have a container of egg salad in the cooler and a loaf of bread to make sandwiches for lunch. In our family, a road trip just isn’t complete without them. 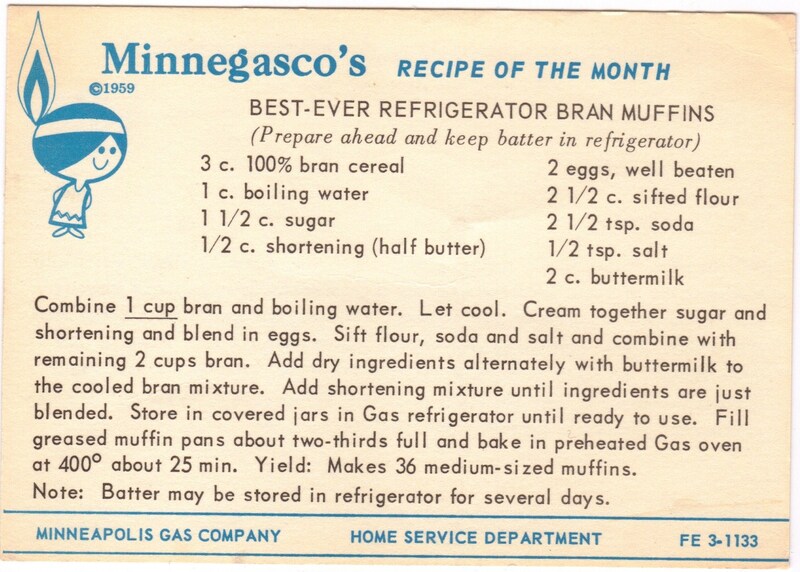 The Found Recipe Box also had a recipe to offer for a long car ride: Best-Ever Refrigerator Bran Muffins. They’re easy to make, healthier than eating at McDonalds and travel well. The recipe calls for bran cereal and I wasn’t sure if it meant flakes or buds. I chose the All-Bran BranBuds cereal, but I was concerned that the buds would be chunky in the muffins so I put them into the food processor, which worked out really well. These muffins are actually kind of sweet, which I wasn’t expecting, and they’re really good with just a little bit of butter and some honey, especially when they’re fresh out of the oven. And the recipe makes a ton, so if you have a long car ride ahead of you, you’ll be all set. Well, it’s time to hit the road. I can’t wait to see my grandmother and share stories from my adventures in the kitchen. And I can’t wait to dig through her recipe boxes to see what treasures she has hidden inside. She is an avid recipe collector. I have dividers in my box to separate the categories, but she has entire boxes dedicated to a category. She has been such a huge inspiration for this project and I can’t wait to thank her in person. I’ll be back in a week, but be sure to check The Found Recipe Box Facebook page for updates! Until then, happy cooking! Happy Trails m'dear! 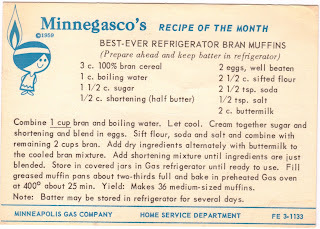 I'll trying those bran muffins! I love all the Minnegasco influences on this recipe. The flame graphic for a feather and the instructions ".... bake in preheated GAS oven at 400º...." Fun find!